Available in 6 Languages: English, Russian, Spanish, German, Italian, Portuguese. Producer and Publisher: Doko Media Ltd. This bestseller book includes all New Discoveries of Megiddo Mosaic, Magdala, John the Baptist Cave, Omrit, Doumus Galileae and much more. 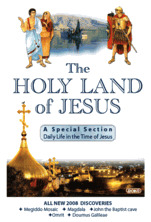 The Holy Land of Jesus makes a wonderful Christian gift and a Holy Land tour guide for any of your friends or loved ones who wish to know more about the life and teachings of Jesus. Every single page contains a treasury of beautiful full-color photographs, accompanied by eloquent and informative explanations of biblical events. The book astounds with accurate yet fascinating cultural, historical, and geographical facts. The collage of breath-taking images and illustrations add indispensable biblical knowledge that was carefully selected specifically to teach and inspire. This book is also a most recommended Israel Tour Guide. "To know more about the land and history of the Bible is imperative to understanding the Bible itself", wrote the Chairman of the United Christian Council in Israel and added "I encourage you to familiarize yourself with tools like this book. Discovery and renewal are in store for you as you explore the Bible's archaeological sites and the daily life at the time of Jesus illustrations - the Galilee, Nazareth, Jerusalem, and the entire Holy Land of Jesus -with this aid. Let your heart be warmed and opened to fresh insights as the Scriptures come alive." "Reading this book attentively could widen your religious horizons and stretch out before you a panorama of faith and history which will enrich your life." Wrote Father Bargil Pixner of the Jerusalem Benedictine Monastery about this very book.